Fishermen might tell whoppers, but hunters always tell the truth. Last weekend my boyfriend and I went on javelina hunt on the Chap. That’s short for Chaparral Wildlife Management Area, south of Cotulla, Texas. We had driven our covered wagon there and brought our personal chef Cookie. We set up camp with other hunters and I impressed all the guys by starting a fire by using my eyeglasses as a magnifying glass to capture the sun’s rays. Everyone started swapping tips on hunting and cooking with game. As evening settled in, one guy pulled out his phone to show us an app with electronic coyote calls. He placed it on a piece of firewood and let ‘er rip. Sure enough, a pack of coyotes circled the fire. The big daddy coyote swooped in, snatched the phone in its mouth and confidently trotted off. The man howled and whipped out a handgun. He shot at the coyote and the beast dropped the phone. We were impressed it wasn’t damaged except for teeth marks in the case. That was enough excitement for one night and we drifted off to sleep. I had the strangest dreams in which the trees seemed to have voices. The scratching of an armadillo on the tent awoke me and I geared up. I reached the deer blind before dawn and climbed the ladder to await javelina. Soon enough, I heard hoof steps. A young buck with little antlers was eating the corn I had left out the afternoon before for the javelinas. 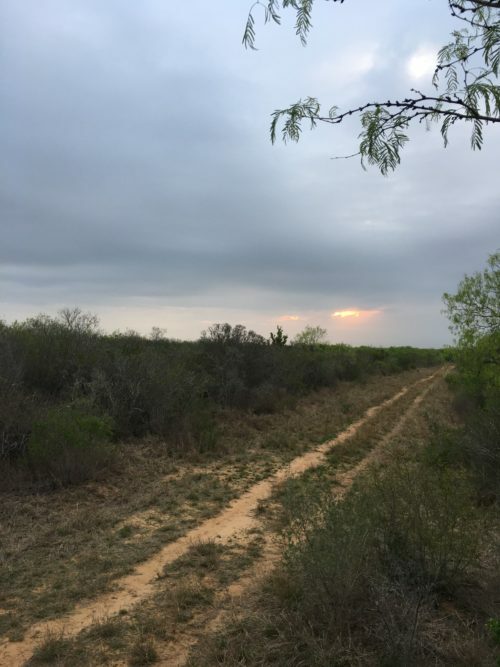 Then, I could have sworn I heard a whisper in a male voice: “Be careful.” I looked down the sendero in the opposite direction and saw a majestic old buck with a huge rack of antlers. Was it his voice that spoke? I shook my head and saw him slip into the brush, like a ghost. The javelina moved forward out of view. It spooked me and I radioed my boyfriend to join me. I told him I spotted what we were looking for and went back to a crossroads of senderos to wait for his truck. We walked back and I showed him the pond where I suspected the javelina were watering. We walked up to the tower blind and got situated. Eventually, three javelina showed up, weaving in and out of the brush and sendero like someone laying a latticework pie crust. Two emerged and started coming our way. It was laborious to watch them slowly making their way along the corn trail. Again, I could have sworn I heard something strange in the wind. Then, a fluttering and rustling as a green jay settled in a branch of a mesquite tree behind me. The javelinas don’t have great vision and they didn’t notice us up off the ground in the chairs. Soon enough, they were walking right toward us. Then right in front of us under our boots. I could not believe it. We barely breathed. Then, they moved along passed us. Byron slowly drew his rifle up to his left shoulder and I drew in a breath. I wrote this after a real javelina hunt for a Tall Tales Contest in my Toastmasters International club. I hope you enjoyed it!